Advances in Atomic, Molecular, and Optical Physics, Volume 66 provides a comprehensive compilation of recent developments in a field that is in a state of rapid growth. 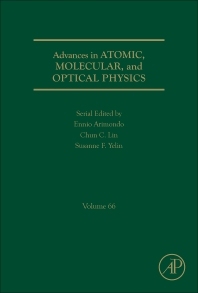 New to this volume are chapters devoted to 2D Coherent Spectroscopy of Electronic Transitions, Nonlinear and Quantum Optical Properties and Applications of Intense Twin-Beams, Non-classical Light Generation from III-V and Group-IV Solid-State Cavity Quantum Systems, Trapping Atoms with Radio Frequency Adiabatic Potentials, Quantum Control of Optomechanical Systems, and Efficient Description of Bose–Einstein Condensates in Time-Dependent Rotating Traps. With timely articles written by distinguished experts that contain relevant review materials and detailed descriptions of important developments in the field, this series is a must have for those interested in the variety of topics covered.